I was wondering if anyone has ventured into having KPP's installed on their violin? I've seen where a few "pro" violinists have switched to them, have any of you? I've played guitar for a number of years, so I'm used to geared tuning pegs. I find it a bit surprising that these tuners aren't in greater use. I know you have to "glue" them to the scroll wall, but it's not truly permanent. Just seems like tuning the fiddle would be worlds easier. I have them on two of my violins. My 135 year old, "DaSalo" and my "FM Concert Master",, I like em. Although you still need to push them in while tuning, they're not totally like a guitar geared tuner. The "DaSalo" has no fine tuner's, but I do still use a fine tuner on the E string on my "Concert Master". I had my luthier install them. He's low priced, $100.00 includes pegs and installation. Hmmm, I don't think you should be having to push them in still if you're using the Knillings (they should be in a fixed state). I've been wondering why and how people are getting away with just using a fine tuner on the E string. Even people that use standard tuning pegs do this, but I can never quite get a perfect tune on my G, D, and A trying it that way. I understand the general want for still having the fine tuner on the E string though. Though, it should be noted I have nothing but a student quality violin and a Cecilio electric, so perhaps it's just the quality of the pegs? @Bobby a lot of it depends on what type of strings your using as well. If your using synthetic strings, (like zyex) they don't need as much adjustment so once you get them in the right area. they usually stay pretty close, only a little tweaking now and then. The E string usually has to have one as its a steel string and a little goes a LONG way with tuneing them! That goes for all steel strings from what i've noticed so you need the fine tuners to get them just right. I know when i switched over to just a tuner on the E string it was just lots and lots of practice and a little bit of peg dope to make my pegs tune smoothly and voila, I can usually get it pretty darn close using my ear, then using a tuner i can get it about spot on every time! If your pegs don't turn smoothly and catch/jump when your tuning then its next to impossible to get them right but if its smooth its really easy! I had considered these pegs. But like rockinglr33 stated.. I have Zyex strings (rarely go out of tune once they are in shape)... and wonderful pegs..easy to tune. Just the E string fine tuner is used and tuning is sort of a non issue. If I had an issue or couldn't get things in tune in 3-5 minutes or if I struggled... I would get those pegs with no hesitation. I have heard good things about them. It is true that you need to push them in to increase friction. This is an intentional design feature which allows you to get the friction that you like and also simplifies the installation process. The pegs are screwed in the opposite direction of tightening strings and by pushing in you can get enough tension to strongly fasten the pegs through the whole length of the threads. I kind of like this feature vs the fine tune pegs that can feel a bit loose, close to slipping, at times. Do you have a preference over the Knilling or Wittner fine tuners? Is there an advantage or disadvantage to them? Still haven't decided 100%. I believe that time will tell. We will eventually hear of which pegs have trouble and need to be replaced over time. They are both great but perhaps I'm leaning towards the Knilling for the moment. Just need to make it clear to everyone that they do need to be pushed in to have enough tension. I use Knillings on my 5-string violin, and they are excellent. I don't use an E-adjuster either - all five strings are tuned by the Knilling pegs. They are easy to use, and quite accurate too. I've never heard of them slipping either. To be honest, I didn't know that the Knillings *needed* to be pushed in while tuning. 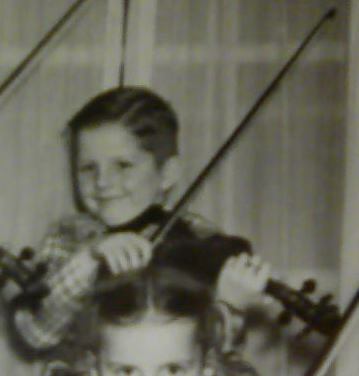 If I tune via the pegs, I do it the standard way, which is pushing the peg in while turning it to tighten, always with the violin in playing position, and while bowing the string I am tuning at the time. I always do it this way with standard pegs, and the habit has simply carried on with the Knillings. As the outer shell of the peg is fixed in the holes, it doesn't move, so I didn't think they needed to be pushed in while tuning. But, evidently, they do. I've had mine for six years now, and they are still working well. I tried a violin with Wittner tuners, but they seem to have graduations of tuning (you can feel a little click when you turn the peg), not 'infinite' turning distances. I am guessing that you push in slightly out of habit. You can test it and you'll see what I am referring to. Pull them out while turning you'll see how loose they get, push them in and they get stiff.